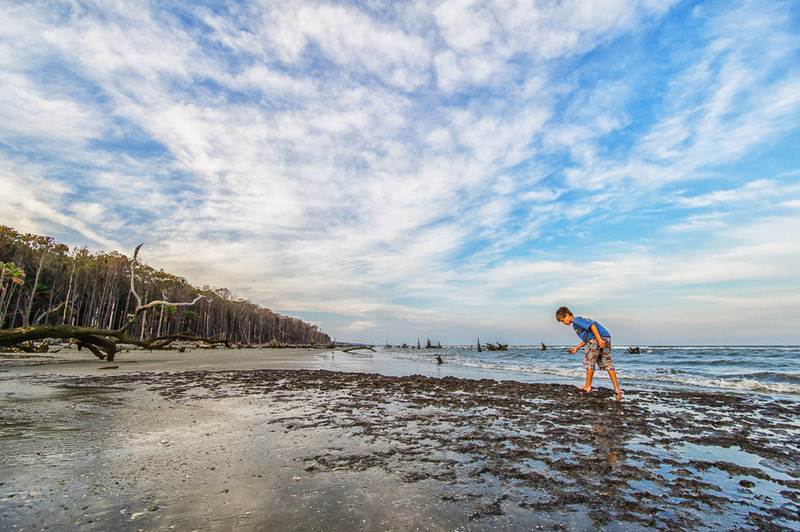 In thinking about Earth, this week’s Fun Photo Challenge theme, my visit to Caper’s Island in South Carolina came to mind. This is a really fascinating place, uninhabited and only accessible by boat, and a wild blend of trees, sand and ocean. The day we visited, it was hazy and gray, and afterward I’d edited a few of the images in black and white, but nothing in color really energized me. But today, when I tried the Color Efex Pro 4 filters, I found some that I liked. This image is Cam searching for treasures on the beach, edited with Detail Extractor and the Film Fuji 160C. These two filters really made the color pop, and even though Cam’s a little bright, I kind of like how he stands out from nature and this very monotone landscape. You can see forever. Such a wonderful photo for this week’s challenge. Thanks ever so much for participating! Thanks, Cee! It’s been a great challenge, and thanks again for hosting! Thank you! It was quite a fascinating place to shoot.